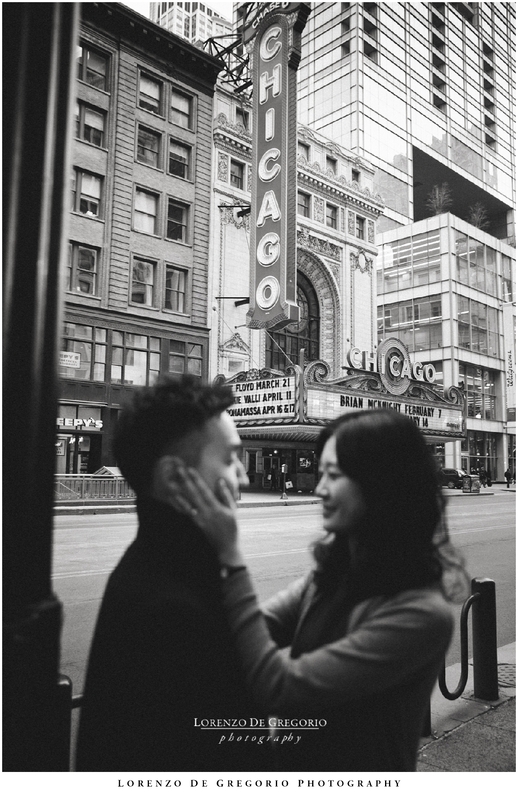 It took me two years to blog this downtown Chicago engagement pictures. I was in town for a corporate event and Se Won asked me to do one hour on the riverwalk. It was the last day of january, with a snowstorm in the forecast and thick clouds gathering for the party. It was cold and the palette was a dull flat grey. To boost the pictures, I decided to give them a parisian feel and to keep the focus ultra thin. I wanted to wash away the background and reduce the buildings to patterns that would make them stand out more. But all of this would have made no sense if it was not that Se Won and Phil are a fantastic couple and a pleasure to spend time with. I edited this collection so many times but I never published it. The original version was mainly in colors but, as I was preparing them for the post, I decided to convert everything to BW. Save one. My friend and colleague Esenam kept asking me: so when are you gonna post them? so here they are now. Downtown Chicago engagement pictures by riverwalk and Lasalle. In the past 9 years I have shot sessions all over the town. If you like Chicago riverwalk, look the pictures of Jackie and Max. Need colors for a winter engagement? 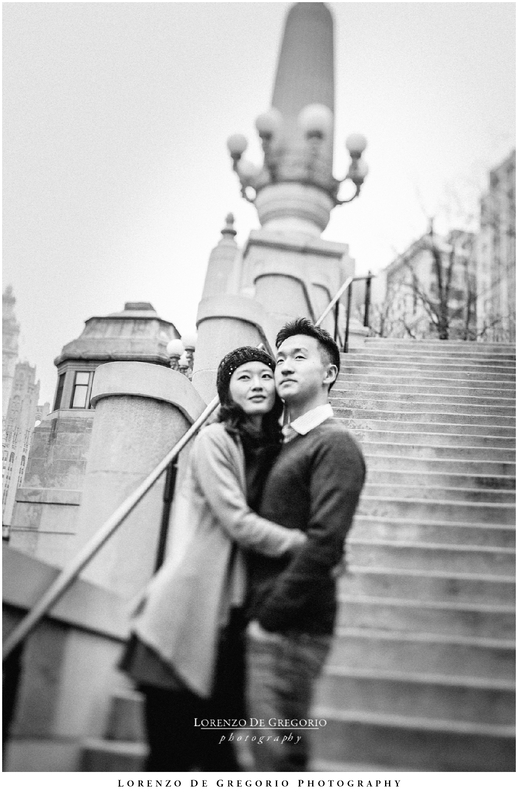 check Lindsey and Mark‘s pictures at Millennium park and at Kenzie bridge. And if you are interested to a downtown Chicago sunrise engagement session, you should check Ashley and Dan’s shoot, Ashley and Chad’s Millennium engagement photos or the Field Museum session of Cristina and John. Lincoln Park is another iconic location and I used it for the recent engagement session of Laura and Michael. If you prefer to catch the warm glow of the sunset, check the session I took for Ann and Phil at Lincoln Park and North Avenue beach. If you are looking for something completely different, then browse the Morton Arboretum fall engagement photos of Brittany and Matt.